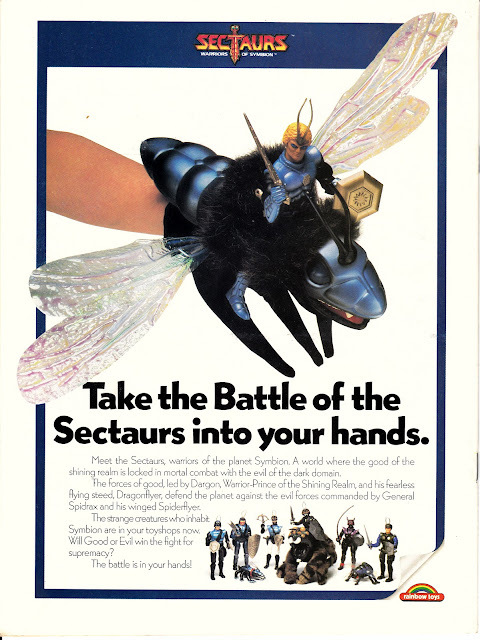 Here's a US TV spot for the short-lived SECTAURS toy line. The insectoid action figures were accompanied by the obligatory animated series (five episodes) and Marvel comic books (eight issues). The UK did see the toys and the comics although the TV show doesn't appear to have crossed the Atlantic. Marvel UK greeted the whole thing with lacklustre enthusiasm: running a reprint of the first US issue as a back-up strip in SPIDER-MAN AND ZOIDS weekly (1986) followed by a solitary one-shot special (Summer 1986). The toys didn't perform well at retail, sealing the fate of the TV show and comics. 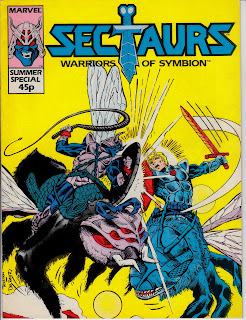 I have a vague memory of buying that one back in summer '86 at 9 years old. however i didn't have much interest in it, and can't say i enjoyed it much. loved the spider-man summer special from same summer, reprinting us web of spider-man #7. Fantastic how you came by this and the other amazing stuff on this blog.